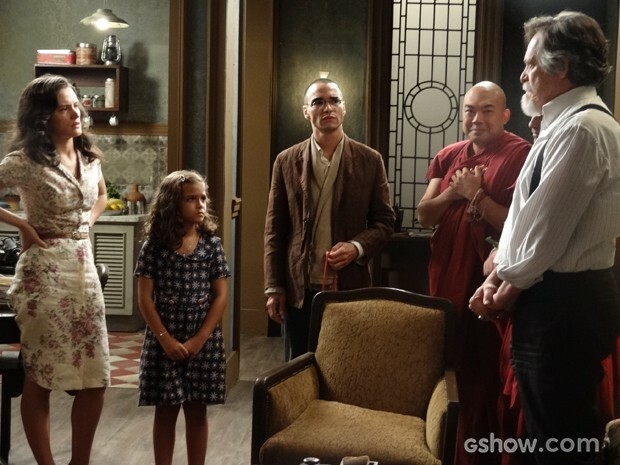 A couple of month’s ago I wrote an article about the Brazilian soap opera Joia Rara (see In Praise of Joia Rara – Globo TV’s Buddhist Soap Opera). This is a fabulous soap opera (which in Brazil only run for one extended series) which Maria and I have continued to enjoy, even for the few weeks while back in the UK this Christmas via the daily clips on the show’s website. It may be worth having a quick read of my initial review, as I do not really want to repeat myself too much in this article. I really wanted to continue from where the previous article left off, and explore the themes of compassion and forgiveness. 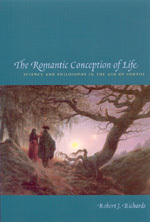 Before though, I thought I would mention that I am in the middle of reading Robert J. Richard’s definitive The Romantic Conception of Life – Science and Philosophy in the Age of Goethe. This monumentally outstanding work explores the Romantic movement of late eighteenth and early nineteenth century Germany, and analyses in detail the science, philosophy, poetry and literature of such intellectual greats as Goethe, Schiller, Schelling, the Schlegel brothers, Humboldt and Fichte. With a remit so broad it almost defies a review, which by necessity would have to be huge. The one element of the Romantic Movement though that I would like to briefly mention is the notion of bildung (a German word). Bildung is a wonderful concept, and for me it represents the inner journey a philosopher, be they scientist or poet, must undertake in order to fully unlock the secrets of nature, psychology, aesthetics and ethics. It is not enough to study knowledge, there has to be a continual process of self-improvement, development and the cultivation of mindfulness, and sometimes it seems that we have lost this cultural habit of developing through life. What has this to do with a Brazilian soap opera? 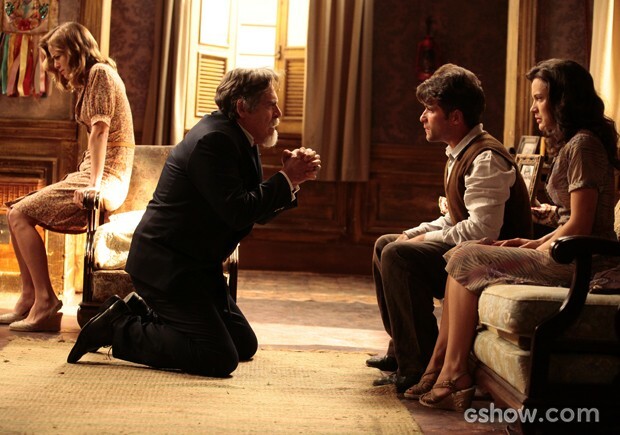 Well I did mention that it seemed to me that many other Brazilian soap operas were insanely shouty. The adverts for the new soap opera at 9pm seemed to be chock-full of full-on slagging matches, well-heeled women to women particularly, and this for me is a huge turn off. I am also a great fan of Warner’s Big Bang Theory, and the only problem is the adverts are full of ultra violent series, way more violent I would suggest than what is shown in the Brazilian soap operas. And to cap it all off, all around the world we have Revenge!, a US soap opera which just puts a hugely foul feeling of despair in my guts. There have been far too many plot twists and turns to summarise, but to try and focus on the main thread, Ernest Hauser, head of one of Brazil’s largest conglomerates, has fallen on hard times. His illegitimate son Manfred has managed to steal and blackmail his way to becoming the new President of the company, leaving Ernest destitute. In order to reach this position, Manfred had to attempt to kill Silvia, a person who had too much information about his illicit dealings, and also blackmail Ernest who in his youth accidentally killed the mother of his three other children, all who are now grown up. Manfred forced Ernest to cut them out of his life, leaving them penniless. With a cast which still continues to produce many outstanding performances week in week out, José de Abreu, who plays Ernest, and Bruno Gagliasso, who plays his son Franz, have supplied two of the most consistently stirring performances of the series. For a British audience who do not know him, de Abreu could be likened say to the late Sir Alec Guinness, bringing a delicate gravitas to a character who is on the brink of reaching an epiphany about his life, the decisions he has made, happiness, and his path to redemption. His own life, he tells Franz, is over, all he can do now is to help Franz become a free man again. As well as suffering from the hideous revelations about his father, he has been framed by Manfred for the attempt on Silvia’s life, and for the last few weeks has been on the run from the police. Gagliasso is an actor who for me has the rare ability to deliver what has been an utterly believeable descent into hopeless despair, emotions that are not often portrayed convincingly. But you only have to take one look into Franz’s eyes to realise that in Gagliasso we have an actor who appears to be wholeheartedly living the pain, emotional agony which plays off against de Abreu’s more nuanced emergence into a deeper level of self awareness of himself in the world. I do not have space in this article to discuss too many other actors, but playing off against Franz (the good guy), Ernest (bad guy come good) is Manfred, whose ascent to the top of Brazilian society has been accompanied by an equally rapid descent into paranoia. In a more complacent soap opera it would be easy for this type of character to suffer from cliche and cartoon villainy. 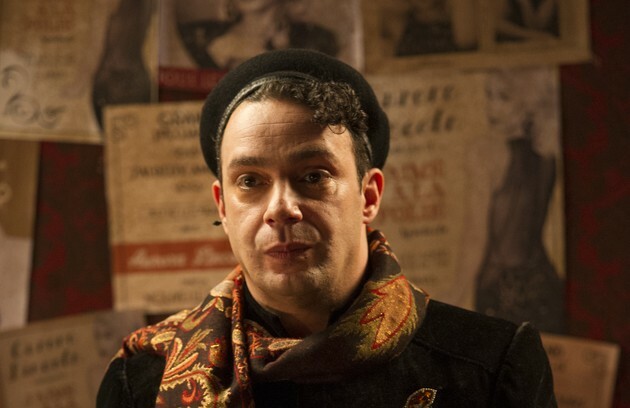 But Carmo Dalla Vecchia who plays Manfred must also be applauded for achieving a level of prolonged intensity in his performance and managing to deliver the occasional shocking and shout-out-loud-at-the-tv-he’s-behind-you moments. In the sub-plots too there have been many anguishing moral dilemmas discussed and experienced, and the writers of Joia Rara too have to be applauded for the continually-evolving story arcs which have managed to retain interest and involvement throughout the entire series. Even characters such as the camp dance instructor Joel, played by the delightfully funny Marcelo Médici, have been given space to evolve and develop, adding some preciously tender moments to their comedic main roles, much needed at times to lessen the emotional roller-coaster ride. 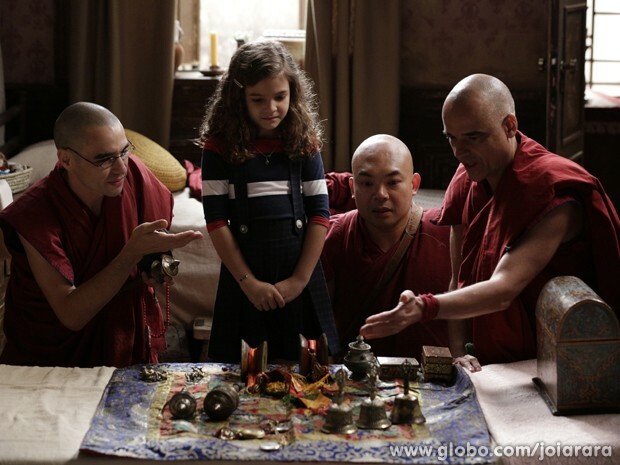 Ernest’s guide into enlightenment is of course the delightful Pérola, played by the young actress Mel Maia, the reincarnation of Buddhist Rinpoche Ananda. It is Pérola who implores Franz to forgive his father, forgiveness which to Franz would seem all but impossible, for there were many crimes of his father revealed to him, including his role in imprisoning his wife-to-be a decade previously, and abducting the children of communist parents to be sent to work as child labourers. This intense scene was phenomenal, and it is here where you realise that perhaps Joia Rara is a Brazilian form of bildung. How many times have you seen such compassion and forgiveness in a soap opera, any soap opera from any country? I can’t think of any instances, and if we are to really educate our children, it is programmes such as Joia Rara they need to be watching. But bildung is a lifetime striving, and if we desire a better society, we have to remember how our ancestors managed such great achievements in all spheres of life that seem so difficult for us today.